Residents of communities near Gaza border demonstrate at Rabin Square against the current security situation. Residents of the communities near the Gaza border demonstrated at Rabin Square in Tel Aviv on Saturday night in protest against the current security situation. 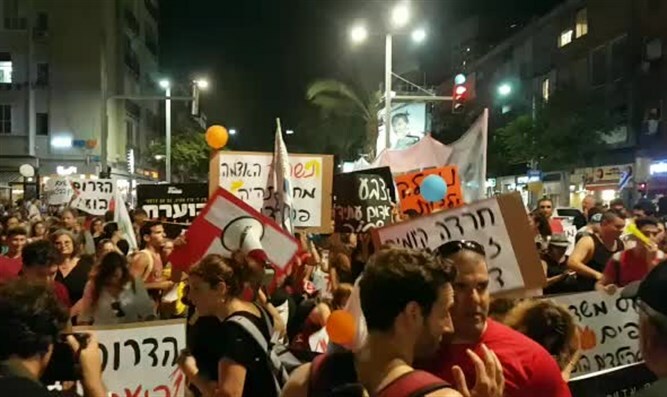 The demonstrators marched through Ibn Gvirol Street towards Rokach Boulevard in Tel Aviv. They set off fake incendiary balloons, sounded a siren and lay down on the ground in order to demonstrate what they go through whenever the sirens warning of a rocket attack go off in the south. The protesters shouted "the government must wake up - the south is burning" and "we are not cannon fodder." They carried signs reading "the south is burning" and "we are tired of burned fields, we are tired of our children crying." Terrorists for months have been using kites and balloons with explosives attached in order to set fire to Israeli property. The thousands of balloons and kites carrying incendiary and makeshift explosive devices have sparked hundreds of fires and caused millions of dollars in property damage inside Israel. Earlier this month, more than 180 rockets and mortars were launched at Israeli territory in one day. Several Israelis were injured in the rocket barrages, including one woman who was critically injured.